Native bees to help in our permaculture garden - Permaculture Research Institute Sunshine Coast Inc.
As many of you already know, the world’s bees are in trouble. Colony collapse disorder, predator beetles and probably a range of other factors that have to do with our lack of care for the earth is slowly annihilating the world’s bee population. We have definitely noticed a decrease in bee activity in our garden this year and are extremely concerned about this problem, since a lot of our plants depend on bees to produce fruit or vegetables. So we were very excited to discover a native beehive in a log on our property. Most Australian native bees are solitary. That means they do not live in a hive but live alone in small holes in logs and other small crevices. Those we try to encourage into our garden by drilling small holes into timber in which they can nest. Solitary bees do not store honey. Honey is stored in hives of social bees during the warmer times of the year so that the bees can survive in the colder times of the year. Due to the winters in Europe being long and cold, the European honey bees make a lot more honey (70 – 100kg per year per hive) than our Australian native bees (only about 1kg per year per hive). Our native bees are only found in the warmer areas of Australia. The hive we found was the Trigona Carbonaria variety (Australian Stingless bees). Tom cut both sides of the log off so only the part with the hive in it was left. Then he screwed blocks of wood to each side to close it off, leaving their natural entrance open. We had to take the hive off the property for about 3 weeks, and then bring it back and put it in its permanent spot in our vegie garden upon return. This was to ensure they would not try and fly back to where they used to be on our property. Tom mounted a little roof over their entrance, to keep the weather out for them (pampered bees…) and found a beautiful spot for them in our vegie garden, under a mandarin tree. Here you see our beautiful little beehive, blending in perfectly with its surroundings. The bees only get active at around 18 degrees Celsius, so we had to do a little bit of clearing in our garden to ensure they have enough winter sun. There will be a floor on the bottom and a lid for the top, possibly with some perspex in between the lid and the top of the boxes, to catch the honey. There will also be an entrance added to the box for the bees to get in and out. Here is the future hive with the honey “super” (no lid yet). As you can see the wood used is very thick, which will be ideal for insulation for the bees, since they are sensitive to temperature fluctuations. We are looking forward to starting the splitting process in the next few months. Watch this space for updates on this process!! This is our existing hive’s entrance. The photo on the left was taken early in the morning when it was too cold for the bees to come out. The photo on the right was taken later in the day with the bees coming in and out. The bees are a lot smaller than the European honeybees. The little dark dots you see are their bodies reflecting the light. 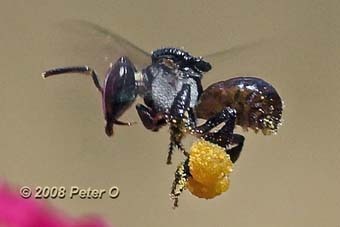 If you would like more information on Australian Native Bees please go to Australian Native Bees website. I rеally love youг blog.. Great coloгs & theme. back as I’m trying to create my own blog and would love to learn where you got this from or what the theme іs named. The theme is called “Further”. And yes, I created the website myself, of course with the help of WordPress! !